Welcome to the exciting, fun way to find your new summer read. Today, I’m featuring an excerpt from a flash fiction short I’ll be having appear in the new, upcoming “Stories On The Go 2”. I had another flash fiction short story in the first anthology which was published last Dec. For this story, I’ve taken a little divergence into the undead world of zombies. It’s a different paranormal direction, and I’m happy to be first sharing it with you, my readers. Before the excerpt, I wanted to let you know about the fabulous giveaway only going on for today. Win all three of my Beware of Warlocks paranormal romance series. If you want to get into the mind of a kicka$$ witch, and see what adventures can happen to you in Vegas, this is the series for you. The giveaway goes on for only two days. It ends July 16. So, enter today and tomorrow only. Good luck! CLICK HERE TO WIN: Beware of Warlocks ebook set! Without further adieu, here is an excerpt from the flash fiction story: “The Infested”. It had taken a long time to find this apartment. I was proud of the high warehouse windows that made the loft homey. A picture from my photo shoots decorated the blinds. I wanted to create change by showing people the problems in society. Pictures of the homeless and poor surrounded me on the walls. That day, I basked in the glory of finally having my own loft studio. Hands on my hips, I stood back to look at the art deco furniture that was my answer to style. White couches and a glass coffee table outlined my living room area. The kitchenette was to the side of my studio set up as a refreshment area. It would come in handy. I never liked to cook, and didn’t need to. We were even lucky to have an Italian place below me. I was more worried about being fat than be infected back then. Everyone would be over to celebrate soon. Bobby was coming. He was the bonus for working with top models. Diane and Mark were coming too. She’d be thrilled to know I was having it all delivered from the Italian restaurant. My friends knew my bad cooking gene. I headed over to the wine rack when the elevator loft started to move. No one had buzzed. Its recognizable whine directed me to look at the elevator cam. A guy with a blue baseball cap holding bags of Styrofoam containers rode up with a dazed look. The whine stopped, and I saw the door move open. He didn’t say a word, but staggered as he followed my orders. I walked over. “So, how much is it?” I reached for my purse on the counter. He stared at me holding the containers. Still, no answer. That’s when I noticed the bite mark on his neck. Blood was trickling down his t-shirt. He was looking at me, and not in a good way. The elevator started again. When I looked over at the doors, he rushed me. Grabbing my arms, he tried to bite my shoulder. My self-defense classes came back to me in a blinding flash, and I pulled a move that kicked him back. I moved backwards keeping my eye on the distressed delivery boy. His eyes moved back and forth to me then Mike. He rushed the delivery boy and swung at his head. The crack of the boy’s skull ripped through the room as blood spattered all over my new marble counter. There was a growl from the boy as he staggered to rise. But Mike didn’t give him a chance as he swung down, and beat the top of his head in. The kitchenette was a tomb. “Mike, what the hell is going on?” I was expecting the night in shining armor save. Not full out murder. “No, I’ve been working on my latest project all day and getting things sorted for my dinner party tonight. You said you couldn’t make it. What changed your mind?” I was trying to make light of the situation. But I was still grossed out by the spattered brains all around my sink. “Just turn on your TV.” Mike slumped onto the couch. The story behind this short is interesting. I was on a ipod radio interview with Jolie De Pre that happens to write zombie stories. I absorbed what she had to say, and then went on vacation on a Viking River cruise. As I was on the cruise, I had a dream about a woman in an apartment, and she gets attacked by a zombie. So, I followed the feelings and what I saw in the dream, and wrote this story. It’s turned into “The Infested” after entering it into a writing contest on Wattpad. So, it’s gone through a few drafts and revisions. I’m still working on it. So, if you have any comments, I’d love to hear about this work in progress. 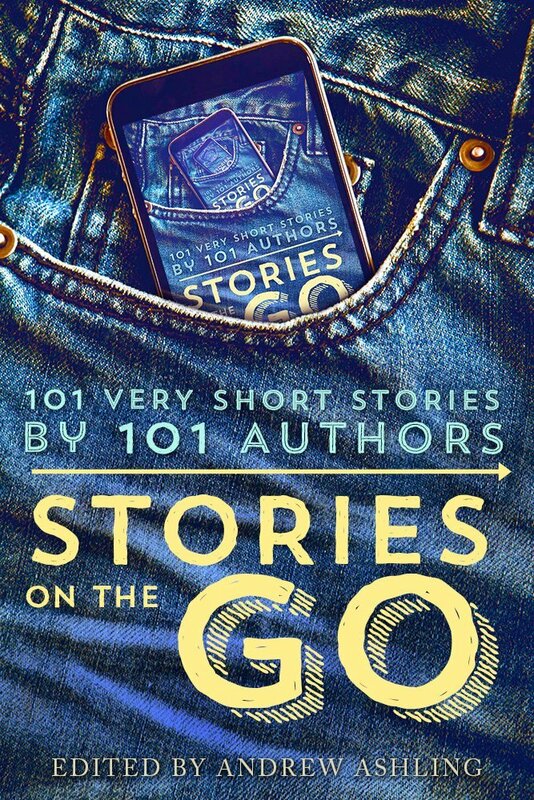 To pick up your copy of the STORIES ON THE GO anthology, LINK HERE! It is FREE! Yup, FREE! There are 100 flash fiction stories from Indie authors. So, it is a great summer read. Can’t beat the price. Look for my story, Payback’s A Witch! So, that’s my contribution to the blog hop. For more great paranormal excerpts, please see the full list of participating blogs at: http://www.simply-linked.com/listwidget.aspx?l=AF5837A6-BA87-494D-8C8B-93C7A15725F7. Enjoy the blog tour! Follow me for more information on future projects and releases! As soon as I saw you were featuring a zombie story, I got excited! Wow! To think I played some role in your inspiration to write a zombie story is pretty cool! That said, the story was fun to read. Yeah, I’d hate to have a zombie’s body matter all over my pretty kitchen counter! I thoroughly enjoyed this. You paint a great picture of the surroundings and you flowed right into action quite well. I can’t wait to read the finished product! Write on! Greetings, sorry for being late with the blog hop – I am playing catch up today since I only had a chance to bounce round the hop really early on Tuesday and hence missed lots of later posts :). Like the excerpt and I love that it was inspired by a dream :). I imagine the dinner party isn’t going to go well given that zombies don’t make great dinner guests :).